An externally focused search for happiness can bring short-lived gains—ones that ultimately leave us wanting for more. More sustainable results can be achieved by another, less common approach: looking inward. That was part of a message of a message of spiritual knowledge, meditation and humor brought by Swami Pragyapad, called the "Smiling Swami," to a gathering of more than 40 people at the Hailey Yoga Center on Sunday. "Happiness is the only thing we want in life," he said. All our pursuits are means toward that goal, he said, be they careers, relationships or money. And, he said, it's not that we haven't achieved happiness, we just haven't been able to sustain it. "Our life is going around in circles with respect to happiness," he said. Swami Pragyapad, a Bangalore, India-based senior international teacher with the Art of Living Foundation, said meditation is a tool that can be used to strengthen our minds and sustain happiness even in light of life's demands. He has taken the foundation's philosophy into violence-wracked schools, tsunami-ravaged areas and prisons to alleviate stress, anger and violence. The swami told the gathering that too often, we try to resolve the conflicts happening outside of us, thinking the conflicts inside will resolve themselves afterward. "It's like telling the doctor, 'I'll take the medicine after I become all right,'" he said. If happiness and peace exist within us from the start, he said, then fear, anxiety, depression and insecurity can fade away. He said meditation helps strengthen the mind, which in turn helps us to not be affected by negative external situations. A quiet fell over the room during a 20-minute guided meditation, a practice that the swami described as "the art of doing nothing." "It's not doing nothing—it's the art of doing nothing," he explained. He acknowledged that it's no easy task. "Quieting the mind is the most difficult thing to do," he said. But, he said, strengthening the "brakes" in our minds increases our ability to correct our responses to situations that we previously assumed were out of our control. The swami led the group through "chair yoga," or yoga that can be done sitting down. "The most important part of chair yoga is to have a big smile," he said, adding with a laugh, "If you cannot have a genuine smile, start with a fake smile." Just when smiles began to fade as participants focused on the movements, the swami slipped in a joke or humorous comment. "Sometimes monkeys do this," he said, as the group patted their stomachs in concert. Ingrid Klumpp, of East Fork, said that although she already practices meditation, she found the session informative. "I came to learn more about the breathing technique and experience peace and joy in my life," she said. For her, she said, meditation "brings everything down and keeps life more calm." Sati Goldwyn, an Art of Living Foundation teacher from San Francisco, said the swami's message fits well in today's society. "I think what he brings and what he teaches people is that what we all want is much simpler than we think," she said. "Slowing down our minds and reducing stress doesn't take that much effort. You can integrate small steps into your life and see results." The swami, trained as an engineer, turned instead to a life of teaching and healing after being influenced by Art of Living Foundation founder Sri Sri Ravi Shankar. 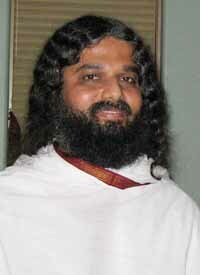 "I really saw the practicality of the knowledge," Swami Pragyapad said in an interview. He said he gets one thing out of teaching: "just pure happiness." "When you see you're instrumental in bringing happiness to people around you, it recharges you," he said. "You feel more and more connected and more and more happy that your life is being used for a good thing." The practice, he said, can be adopted by all people because it is inclusive of all belief systems and religions. "That is our success," he said. "We believe in only one religion, and that is the religion of love."